HuffPost TV caught up with Michael C. Hall, who talked about his experience on the series, his plans for after the show, and which bloody mementos he's decided to keep as souvenirs. HuffPost TV: What was the last day of filming like, and who will you miss the most out of the cast? Michael C. Hall: Oh, gosh. The last day was -- I mean, there was such a series of lasts over the past couple of weeks. You know, different people had their last days at different times. But the very last day was I don’t know, a combination of pride and sadness, wistfulness, and relief, and vague depression. It’s been eight years of all of our lives; cast, crew, and beyond, and there’s a collective sense of a major end, a major transition, but also a new beginning for all of us. It’s hard to pick favorites among my castmates, but I suppose the person with whom I've had the most significant journey as a character is Jennifer Carpenter and the Deb character. They've been through so much and covered so much terrain and she’s been such an amazing scene partner thorough this entire process. 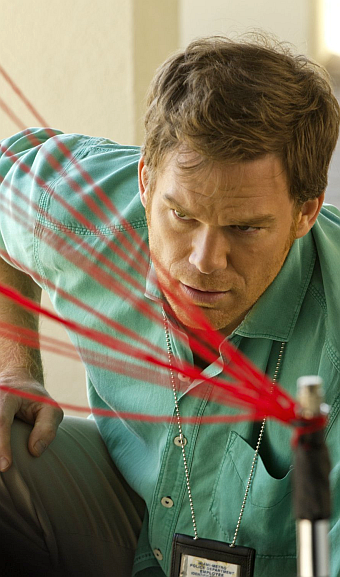 Are you afraid of being typecast after eight years of "Dexter?" It goes with the territory. If you do a character for this long, people are inevitably going to associate you with that character. Dexter is, I suppose, a character who operates under a particularly dark umbrella. You know, I'm thankful to be associated with a character who has this much variation and dimension. I finished "Six Feet Under" and got a lot of questions about being typecast as a gay funeral director and now everybody associates me with a serial killer with a code, so I'll just have to deal with that. I think if people’s imaginations begin and end with "Dexter," I’ll leave that to them and try not to concern myself with it too much and just look for opportunities that allow me to mix it up and broaden the spectrum of what I've done. Read the rest of the interview, after the jump. What would it take for you to sign up to another TV series now? I don’t know. I didn't think I'd do another TV show when "Six Feet Under" ended, so I certainly learned to never say never. And "Dexter" is something that I couldn't have quite imagined before it came along. So if and when something emerged to inspire me to take that leap again, I'd like to think it’s something I can’t quite imagine. I do feel like I this time around do want to take some time before even considering that possibility, but I don’t want to forsake any goodwill or opportunities I might have on the television front. I guess it would ultimately come down the character and the writing. When "Dexter" started, you were the only serial killer protagonist of a TV series. Now with "The Following," with "Hannibal," it’s almost a trend. Do you think that in some ways "Dexter" influenced these shows? I think a general fascination culturally with serial killers has been around for a long time as far as making them featured characters on television series. Maybe that's a trend that Dexter started. And if that’s the case, I'm OK with that. I'm proud of that. I do think "Dexter" remains a unique creation no matter how many other serial killers populate the air waves. I think now and always, there'll be a general fascination with the darker sides of human nature and human behavior, and depicting and examining someone who is a serial killer certainly appeals to that appetite. Well I feel good about that. I feel good generally about any show that paints a picture of female characters that are complex and strong. I really think as much as anyone, it’s the females in Dexter’s life who have exploited his appetite for humanity and human connection and have spurred him forward. Sometimes, it feels like the women in Dexter’s life dance around in his pretty significant blind spots. And I think Dr. Vogel in a very new way, not as a potential love interest, but as someone who reframes his origin story and is -- as she puts it -- a spiritual mother to him. She definitely presents a strength that he I think craves and has never seen before. There has been lots of speculation that Dexter has been dead the whole time, so what do you make of that? That he’s been dead the whole time? Like a flashback or with the voiceovers -- things like that. You know, I'm not going to say definitively that that’s not the case, though I don’t know. I think that might be a cop out. But, I do know that when I started the show and tried to think specifically about the nature of the voiceover, I did have the thought: who is Dexter talking to? Why is he saying these things? And, I imagined him in between heaven and hell, in purgatory, and the story of his life is being played in front of him and he had to narrate it to justify his behavior to his interrogators or whatever. But, that was more just an imaginative exercise. I won’t say that it’s a total impossibility, but I don’t think we’re going to discover that Dexter is dead. Are there any souvenirs you took away from either Dexter or the set? Oh, well there are some more abstract blood spatter images in Dexter’s inner lab that some of the production people were going to frame for me. I'm not sure exactly where I'll put them. Also, his ID badge that he wears whenever he’s at work and the watch that I wore over the course of the eight seasons; I'm going to take those two things just because, you know, they were on my person and so much a tactile part of my experience of playing the character. I'm not super sentimental about things, but everybody encouraged me to make sure I made off with something and told me I'd regret it if I didn’t, so I've got that stuff coming my way. Do you think you could actually put those pictures up in your house somewhere? Yes. If I find the right spot. You know, maybe basement bathroom.